L.N. I completely agree: there is definitely a sense of the work feeling contained and intimate, as opposed to exterior or outward-looking. G.W. A very observant friend recently said that my pots were empty on the inside and full on the outside. SONGS FOR A ROOM turns this notion on its head. L.N. Yes, that’s true! It subverts, or, should I say, inverts, domestic craft in so many ways, including conventions around the decorative. But conversely, I also think the project realises the intrinsic functionality of your objects – something we don’t often get to see in a gallery context, where your work is often presented in a very considered way: carefully placed on a plinth, softly lit, revered and out of reach. SONGS FOR A ROOM not only challenges that type of presentation, but also honours the true intention behind your making. G.W. The idea of function has always been important to me, and domestic ceramics function in a number of ways and for a variety of purposes. The way the object works – how it feels, its weight and pour, and its relationship to the body (finger to handle, hand to belly, lip to lip) – is of interest to me. These are objects to be lived with and, subsequently, they are kind of invisible. We have very low expectations of them, and I think this opens up the potential for quiet subversions to be concealed on their surface. I like the potential for an object’s meaning to unfurl slowly over time through daily handling and use. L.N. When ACE Open invited you to undertake this project, one of the things that really stuck with me was your claim that your work sat strictly within the realm of craft and design. 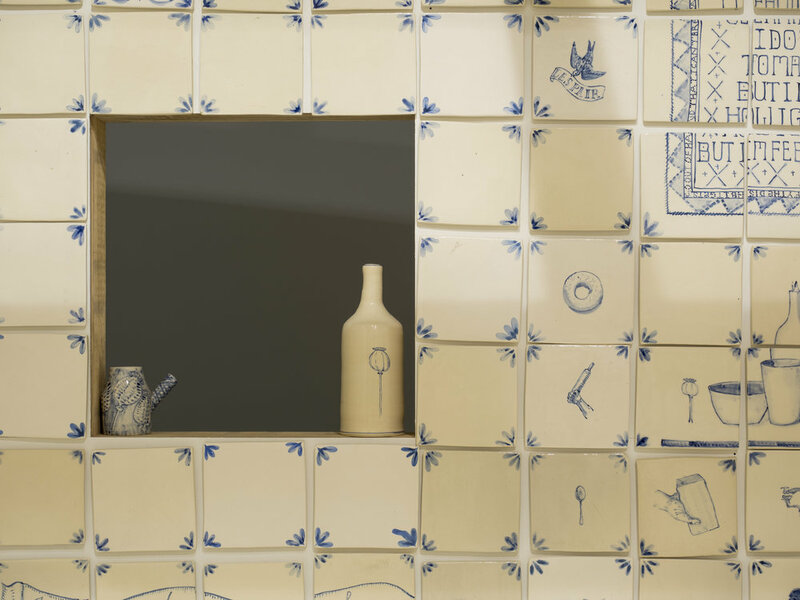 Ceramics has undergone a revival in the past seven or eight years, but despite its rise and fall in popularity, you have worked with the medium for over 40 years. Where do you think you sit alongside your contemporaries and the new wave of contemporary ceramicists? G.W. I don’t really think I sit alongside them, though I respect and appreciate their work. The makers I share an affinity with – including Toni Warburton, David Ray, Stephen Bird, Patsy Hely and Stephen Benwell – make work that is rooted in the canon and history of pottery. My practice also stems from this history, although my head is very much in the here and now. That is the contemporary part. For me personally, ceramics is an activity positioned on the boundary of artmaking, and I am interested in the relationship it has with the domestic sphere. L.N. Speaking of the here and now, your work draws a lot from music, particularly folk and country. SONGS FOR A ROOM is interwoven with lyrics from Leonard Cohen, Neko Case, The Drones and Nick Cave, to name but a few. You have previously said that your work is perhaps more inspired by songwriting than the visual arts – why is that? G.W. For better or worse, I am more interested in written language (words) over the visual. I have always used fragments of song text in my work, both as decoration and explanation. I find great joy in pulling an existential message from a pop song. Whether it is Beyoncé or The Smiths, song lyrics can have personal mottos or motifs for people. Funnily enough, this approach was being used by potters in Tehran centuries ago, so in a roundabout way it still somehow comes back to pottery. L.N. So how has this project – held in a contemporary art space – changed your own perceptions about your practice? SONGS FOR A ROOM definitely marks a change in the direction of your work. G.W. Opportunities such as this are rare and unlikely to be repeated, and I feel really lucky to be given a space to do what I want, and to feel safe and supported in that. The project has reinvigorated my thinking about the potential of scale and repetition in the ceramic sphere, though work is never finished or resolved. So I see the room as a step forward, but also sideways (like a crab). Once a potter always a potter. ‘Gerry Wedd: SONGS FOR A ROOM’ was exhibited at ACE Open, Adelaide, from 28 July until 15 September 2018.